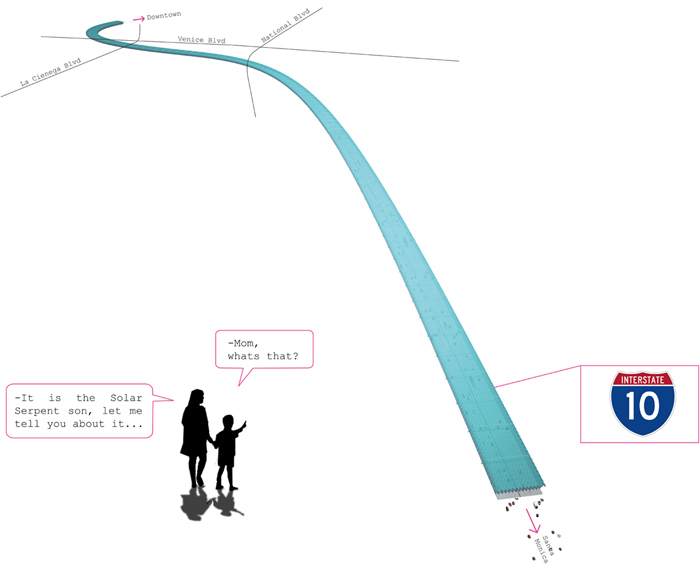 The project was first exhibited at the 2010 Toward a Just Metropolis conference at UC Berkeley and presented at the Swedish Embassy’s Imagining Beyond 2020 conference in Washington, DC. Due to the low areal energy generation of solar cells, allocation of land use is a central issue for any solar proposal. The Los Angeles Solar Program focus on roofs on private and public buildings within the city and a gigantic solar plant in the Mohave desert. 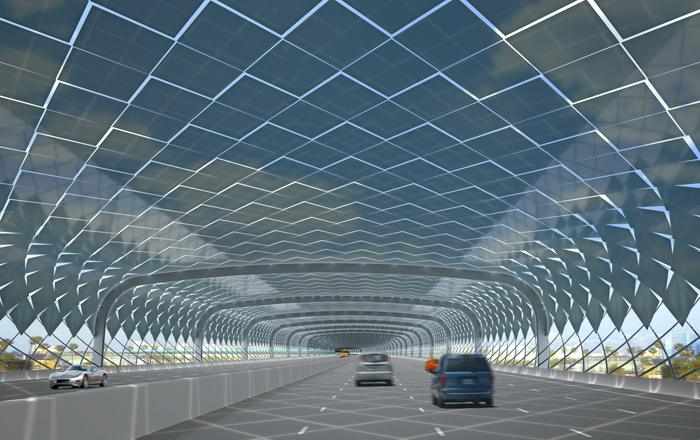 With Los Angeles County having 800 km of freeways – public land with existing points of access for maintenance – why not use some of them for the location of a large scale solar installation? 1. Solar panels need unshaded sun away from neighbours and palmtrees. 2-3. 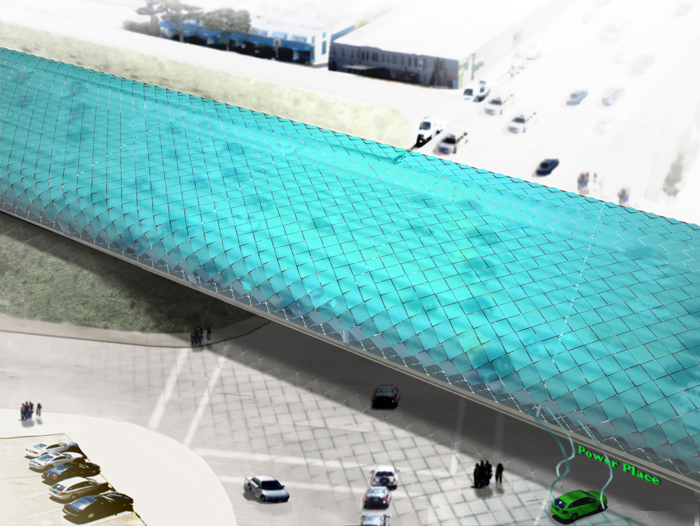 The Solar Serpent will shade the roads and reduce the need of air-condition. The energy production peaks mid-day when energy consumption for air-condition peaks. Bonus effect: UV damage on roadsurfaces will decrease. Under main road overpasses electric cars can be filled at the “Power Place” charging stations! The locally produced electricity will be sucked up by households and businesses locally in the grid with minimal transmission costs. 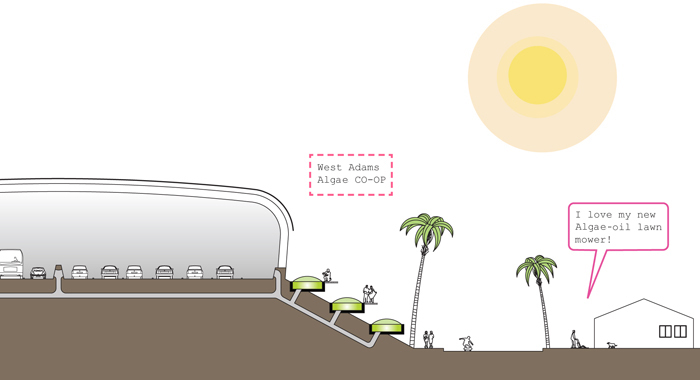 The CO2 rich air on the road is brought through pipes into linear covered algae ponds along the freeway. This will bring green tech jobs, such as farming, harvesting and processing of biofuels, to the neighborhoods that today are the most disadvantaged by their proximity to the freeway.